A favourite for lunch and dinner! 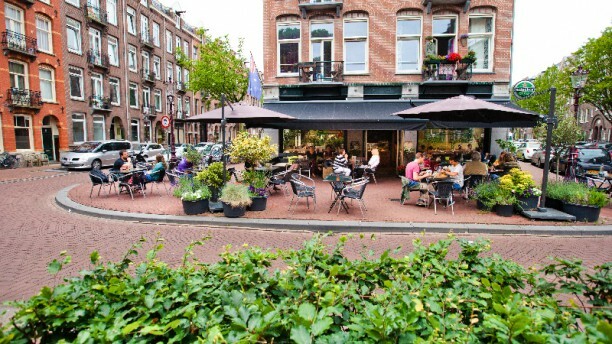 In this beautiful restaurant in the east of Amsterdam, located on a cosy square, you can enjoy delicacies from Austria like nowhere else. Let the chef surprise you with the flavours from ‘down under’ and enjoy the hospitality of the friendly service. Good restaurant: nice atmosphere, timely service, and good food at a decent price. I always like it here. Good food and the staff is always super friendly! This is my favourite anglo-saxon-style brunch place in the neighbourhood. Friday morning is nice and quiet. Portions are not big (if you are very hungry, order a side of something) but the food is amazing and the coffee is really good, too. So happy we found this place, just around the corner... loved the wine, starter was amazing and the main dish delicious!!! We’ll be back! We had a great time here, the interior is very cozy and the food very good. The only feedback that I have is for the staff. The service was very friendly, but they didn't ask if we wanted anything more to drink when our glasses had been empty for a while, or if we wanted the bill even though it'd been 15 minutes since they cleared our table. Actively trying to get their attention took a while too. Even though there was something they could improve on the rest of our experience was great! Will come back for sure. Really good food! A few vegetarian options (I think the burger can even be made vegan). Super nice staff. Too bad the location is a bit out of the way, or more accurately, in a too-residential neighborhood, because this should be much more of a trendy place than it is right now! Highly recommend Drover's dog in OOst!! We had a truly delicious meal and a warm, aussie welcome. Even the kids menu (buttermilch chicken) was mouth watering. Friendly and welcoming environment with kind and relaxed personnel. Tasty meals (sea bass, angus burger). Pumpkin Soup was great taste but needed more blending for smoother end result. Go again for sure. No table although reservation was confirmed. 1h15 waiting time for eggs. Very friendly people though. Decent food, beetroot burger did not live up to the many recommendations unfortunately. Fries with tasty herbs, but cold and very greasy. Starters nice, tuna and skewers. Coffee in the end Italian quality. Cosy place, original and nice people. Overall a little bit too much out of the way to visit again for this menu however. Very Nice food!! I had the kangaroo skewers with melon. Could serve a bit hotter. Lamb rack as a main absolutely godlike. And lovely sweet patato. Girlfriend had the salt n peppa squid. Nicely battered not fat or greasy at all. Refreshing taste, very fresh! She had a skippy as a main, very rich meat, good flavor, texture and color. Good service very well mannered young bloke from Columbus Ohio and an UK bloke from Barth. Good chats. Oh yeah also they have there own grog and wines, you should try them also very nice. And the best thing of all was the price, they are that cheap I could not believe it at first! We had a lovely anniversary dinner at Drovers Dog. The service was excellent, food very tasty and nice surroundings. I would definitely recommend it!